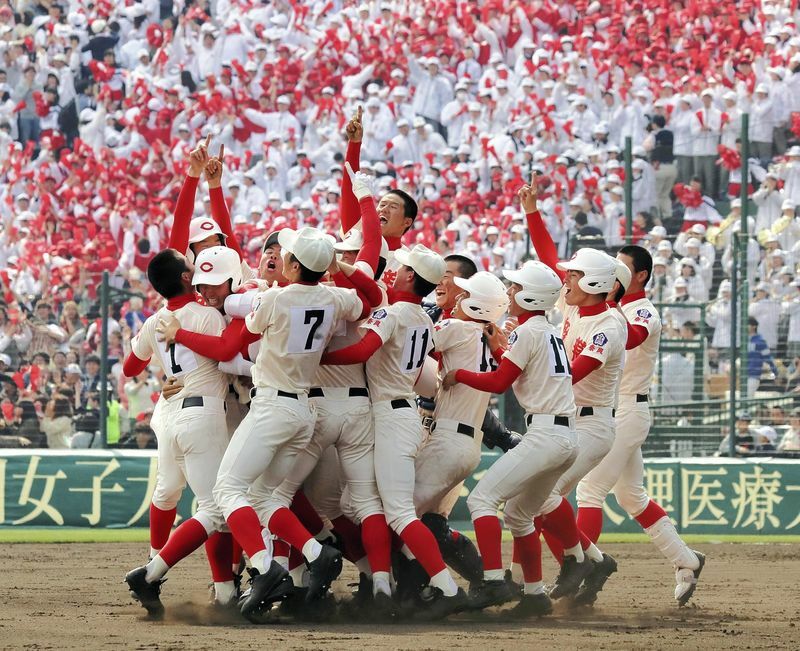 Chiben Gakuen Senior High School players celebrate winning their school’s first championship at the national invitational tournament at Koshien Stadium on Thursday. (Jiji) Chiben Gakuen Senior High School won the National High School Baseball Invitational Tournament by defeating Kagawa prefectural Takamatsu Commercial High School in extra innings on Thursday, as the Nara Prefecture school prevailed in the bottom of the 11th inning for a 2-1 victory at Koshien Stadium. It was the first championship for Chiben Gakuen, which had never been to the finals of the spring or summer versions of the national tournament. Chiben Gakuen became the first school from Nara Prefecture to win since Tenri High School did so in 1997. Takamatsu Commercial was looking for its first championship since 1960. With two outs and the score 1-1 in the bottom of the 11th, Naoki Takahashi singled to center. Starting pitcher Shogi Murakami then hit a double over the center fielder for the game-winning hit, with Takahashi scoring all the way from first base. Murakami pitched a complete game, allowing just one run in the eighth inning. In that eighth inning, Takamatsu Commercial tied the score, starting with an infield single by leadoff hitter Tsubasa Anzai. After getting to second on a sacrifice bunt, Anzai scored on a single to center by Keizo Yonebaku. Takamatsu Commercial starting pitcher Daiki Ura threw well until giving up the winning run.